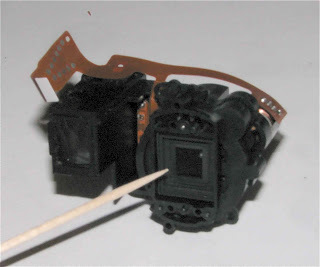 I read about Mark who modified a FujiFilm Digital Camera to make it work in the Near Infrared region. I had an old Canon PowerShot A200 so I decided to see if I could do the same. 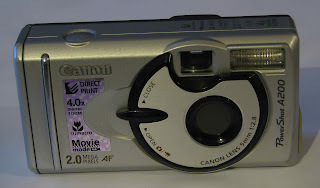 The aim is to remove and possibly replace the IR filter within the camera. The IR filter blocks the infrared light so that, presumably, pictures look roughly the same as they do to the naked eye. I began by removing all the external screws that hold the camera case together. Four from around the battery cover were longer than others. 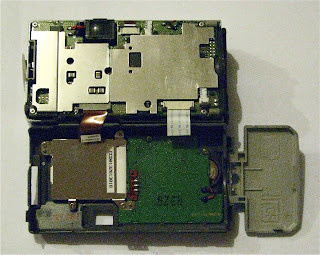 Next I gently removed the back cover which I discovered is wired to the camera chassis by two flexible ribbon cables. 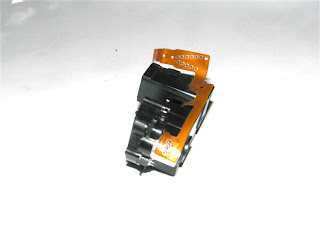 The connectors have a black plastic locking piece that you can see either side of the ribbon cable towards the bottom of the light coloured connector. I pushed these down about 1-2mm and the ribbon cable easily came out. I gentle separated the front case from the chassis. 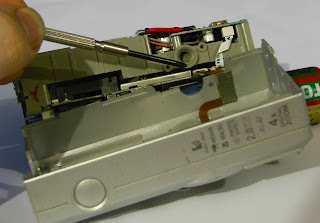 It too is attached by a small ribbon cable but in this case the connector does not have a locking piece. It does have a small plastic reinforcement strip that I gripped with needle pliers to remove the cable as the following video shows. It may be possible to leave this cable in place if you don't want to remove it, but it will be more awkward to remove the lens module. Now I removed the lens module. 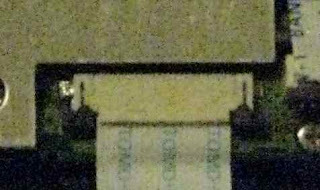 Here is a picture of the image sensor with the lens removed. The IR filter is located on the lens module, just under a rubber boot. The boot was affixed with a little adhesive, but it was easily separated from the module. 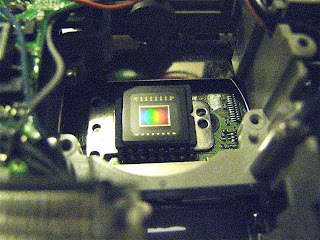 The IR filter is also glued to the lens module. I disassembled the module to remove it, but it would be much easier to just pry it out from the outside. A small knife or tiny screwdriver should work ok. 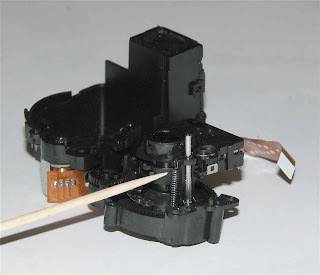 The problem with disassembling the lens module is that you can easily make the lens dirty and it has a number of parts including a spring that are fiddly to put back together. This is what it should look like before and after re-assembly. 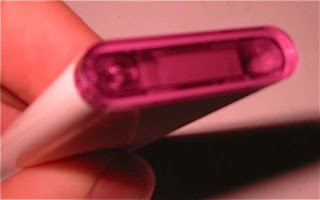 Note how the small spring attaches to the lens. The lens module has a gear that can be turned with your finger. As you turn it you should see the lens slowly move in or out. Do this to verify that the lens focus gears are working correctly. Here I had two options: 1. replace the lens with a visible-light filter as Mark did or 2. leave the filter out altogether. I tried both methods. If replaced the camera is only good for IR photos. If removed, you can take regular photos but they will look a bit different. To take IR photos you can hold a visible-light filter over the lens - not ideal but a reasonable compromise if you don't plan to use it too often. Now I just had to reverse the process and reassemble the camera. Try not to force it together. The pieces will fit together fairly easily once you find the magic initial orientation of each part. I only have one half-reasonable image of a Mac remote control. To the eye it is black, but to the modified camera it is clear as glass.